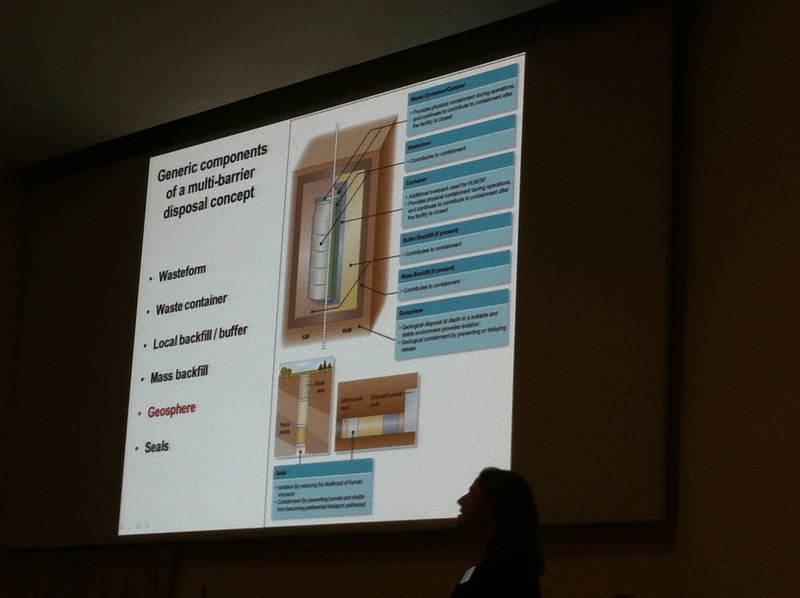 Radioactive Waste Disposal in the UK – the start of a new screening process. Today I attended a meeting that marked the start of a long and complicated process – the initial geological screening for a location to dispose of the UK’s radioactive waste. Some of you may remember that this is a process that has already started once, back in 2006, but which ground to a halt last year, when the only remaining council considering volunteering, West Cumbria, pulled out of the process. Because of this, the government has decided to start the recruiting process all over again – in an attempt to improve how the site is selected. 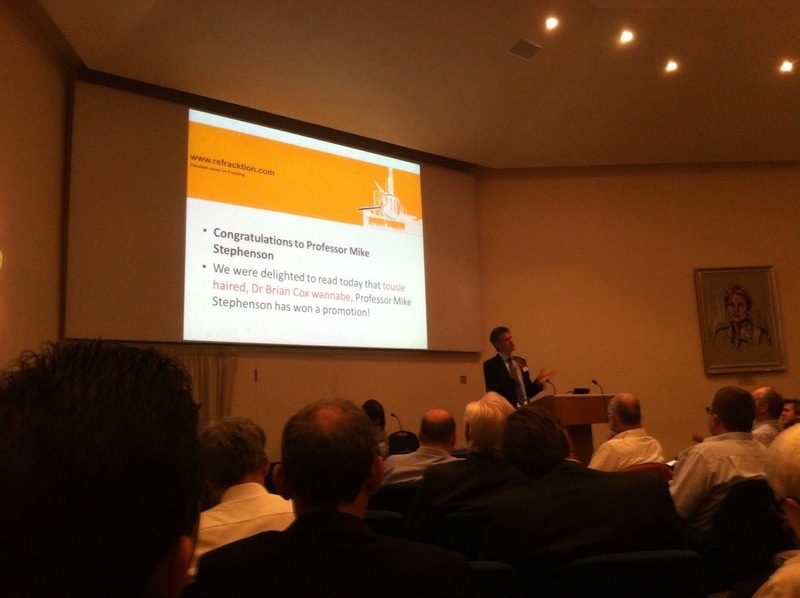 As a result a new White Paper outlining the Nuclear Decommissioning Agency’s (NDA) plans was published in July. 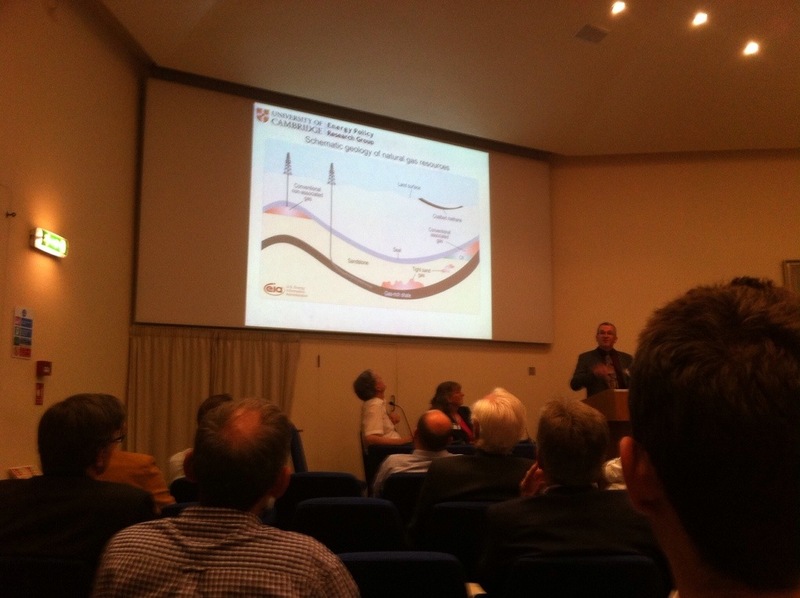 UK Government has published a renewed process for siting a Geological Disposal Facility. Implementing Geological Disposal outlines an approach based on working with interested communities, beginning with two years of actions overseen by Government and intended to address issues that the public and stakeholders have told us are important to them. The UK Government remains committed to geological disposal as the right policy for the long-term, safe and secure management of higher activity radioactive waste. 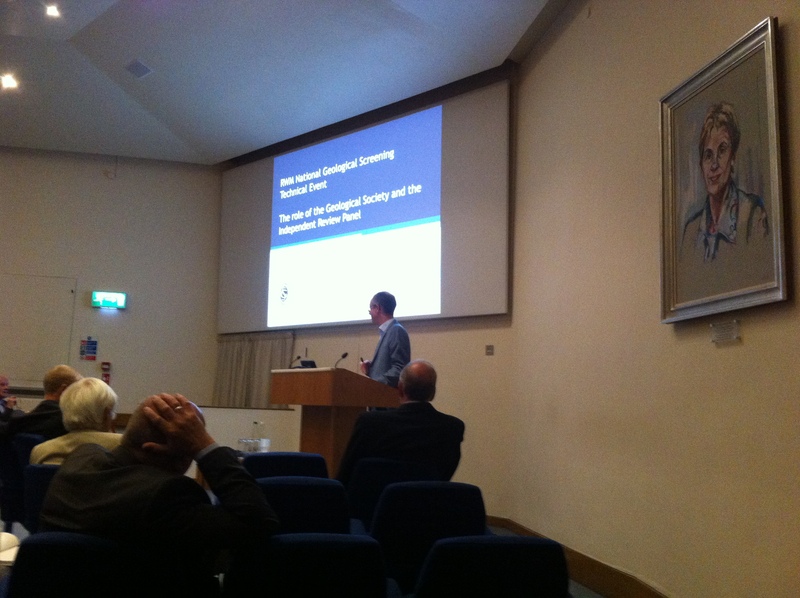 Today’s meeting was held at the Geological Society in London and was proposed as the first step in establishing a dialogue with different stakeholders that would assist in creating guidelines for areas considering volunteering to be assessed about their suitability to house a deep geological storage facility (so basically it was asking people ‘who should be involved in the discussion to set up the plan to invite the public to volunteer to take part’ – it’s a REALLY early stage). It was organised by the Radioactive Waste Management (RWM) section of the NDA and featured speakers from across industry, academia and government. During the meeting it became increasingly clear that far from being a straightforward process, this was a very complex set of stages which could be (and were) interpreted differently. Part of this is due to the complicated nature of the material we are dealing with – radioactive waste. So before I dive into the meeting, here is a quick look at radioactive waste. Now when it comes to radioactivity, I have a bit more familiarity than many people, and interestingly it’s not because I am a geologist. Firstly, I grew up in and now live again in Devon, an area known far and wide for it’s granite. Now granite (like many igneous rocks – ok a little bit of geologist escaped there, but you don’t need to be a geo to know this) is a radioactive rock and one of the forms of radioactivity released is a gas called radon. In Devon, most people have at least heard of radon, and some people have radon detecters. The closer you live to the moors the more likely you are to have had your house tested for radon. In fact, there was a toilet in Chagford (central Devon) that became famous as ‘the most radioactive loo in the world‘ due to the amount of radon being so high, that if you were in there for an hour you would get more than the recommended annual national level of radon!! The second reason that I am familiar with radiation is because I live in Plymouth and Plymouth houses the Trident submarines. The Tridents are the UK’s nuclear deterrent subs, each loaded with a nuclear weapon. 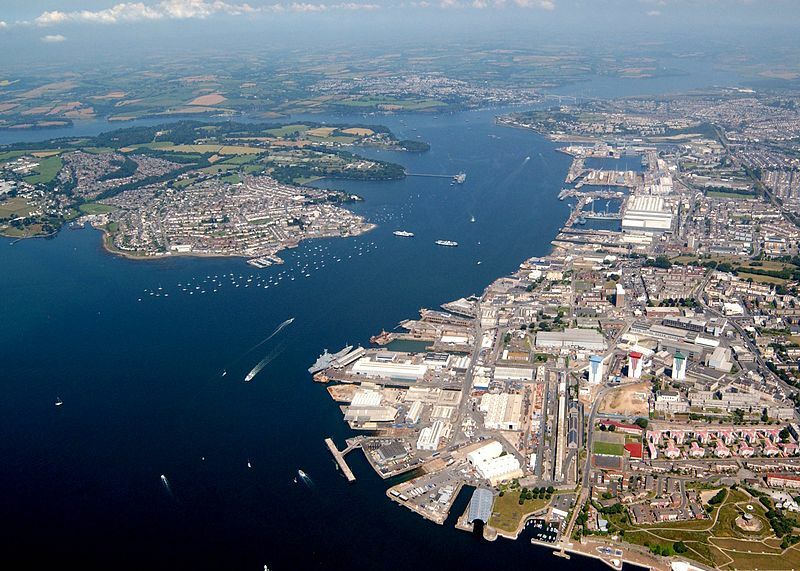 Every week the dockyard tests it’s contamination alarms – sirens that echo the days of the blitz ring out across Plymouth (waking up the lazy students) – it’s a very audible reminder that a few miles away from the city centre is a fairly large concentration of high level nuclear material. As you can see the Naval Base (on the river) isn’t far from the city (image from Wikipedia). But what if you don’t live in a granite rich (radioactive) area or near one of the dockyards that services the nuclear submarines? Have you ever come into contact with radioactive material? Well leaving background radiation from the planet and the sun aside the answer is probably yes. In fact you have probably had a hand in creating some of your own radioactive waste. How you may ask? Well when I was told this I couldn’t believe I hadn’t realised it. A large proportion of our radioactive waste comes from……. medical facilities. Yep. Ever had an x-ray? Even a dental x-ray counts. And that is only one of the myriad ways that we use radioactive materials. And that’s not even thinking about some of the more intensive therapies – radio-therapy for example? So radioactivity isn’t unfamiliar, well, kind of, but radioactive waste and what we do with it – certainly the concept of burying it – is. 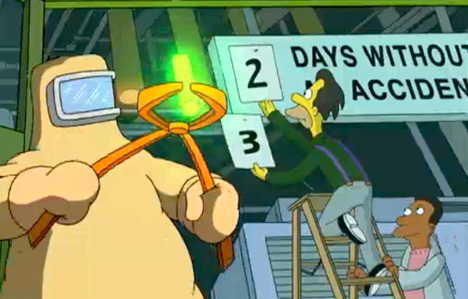 Most of us (myself included) have never seen radioactive waste beyond the glowing green gunk housed in lurid yellow containers (probably leaking) as depicted in popular media from the Simpsons to Spiderman. And with that in mind, having radioactive waste anywhere nearby (with the possible addendum that you might get superpowers from it) is pretty terrifying!! Radioactive materials in ‘The Simpsons’ usually glow green (image is from TheBrainCage with a great article about the colours of radioactive materials). The really radioactive stuff may be the most dangerous, but it also takes up the smallest proportion of radioactive waste in the UK. But what do the different types of radioactive waste mean? Well, here is a quick summary. There are three main types of radioactive waste, and they are divided by their intensity. These three types are high-level, mid-level and low-level and they are categorised in the following way (description provided by Richard Shaw from the BGS, also available here). Low-level waste (LLW) comes from hospitals and industry, as well as from nuclear fuel. It includes paper, rags, tools and clothing, which contain small amounts of mostly short-lived radioactivity. It does not require shielding during handling and transport, and is suitable for shallow land burial. To reduce its volume, it is often compacted before disposal. 82.67 % of the volume of waste produced in the UK is low-level but it accounts for 0.0003% of the radioactivity of all radioactive waste. Intermediate-level waste (ILW) contains higher amounts of radioactivity and some requires shielding like protective clothing between stored waste and humans. It typically includes chemical mixes and metal fuel cladding, as well as contaminated materials from reactor decommissioning. Smaller items and non-solids may be solidified into vitreous waste (like glass). In the UK it makes up 17.26% of the volume and has 5.8% of the radioactivity of all radioactive waste. 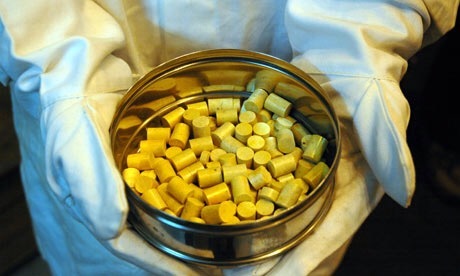 High-level waste (HLW) is generated from the ‘burning’ of uranium fuel in a nuclear reactor, is the most radioactive waste produced and can be long or short lived. HLW contains products generated in the reactor core. It is highly radioactive and hot, so requires cooling and shielding. HLW accounts for over 94.2% of the total radioactivity produced industrially, but only approximately 0.07% of the volume of radioactive waste produced in the UK. So we have this waste, that doesn’t look like we thought is would and comes from places we hadn’t expected, so why are we only hearing about it now? Because at the moment we are storing our waste on the surface, in secure buildings. One of the things raised in today’s meeting was the idea of keeping the radwaste ‘safe’ but this plays into my questions about why are we thinking about radwaste now – ‘safe’ from what? Are we worried about keeping ourselves safe from the radiation, or the radwaste safe from us? It seems to be a mix of the two. Firstly, despite our proximity to a myriad of sources of low level background radiation, from the sun, to the rocks to your friendly neighbourhood x-ray technician, radiation in high doses, for prolonged periods of time is dangerous. It impacts not only us and our health, but the environment too. As such we protect ourselves from it. But lets be honest, all those movie stories with runaway trains that just happen to be strapped with a dirty bomb don’t come from pure fantasy. There are utter lunatics in the world who think it’s a good idea to create a weapon from something so devastating that it could wipe out all life in a 100mile radius. We are a violent species. And as much as I hate to think it, the chances of another war happening in the future are not remote. If that happens, is it a good idea to have a supply of radioactive material just lying around?! So the radwaste also needs protecting from us. Thinking about burying the radwaste keeps it ‘safe’, from both perspectives and in that respect I think most people (in the abstract at least) would agree that burying radioactive waste is a good idea. But as we come back to this concept of burying the waste, we start to encounter one of the problems that I saw in the meeting today. It is at this point that nuclear scientists and geologists start to move into an extremely technical discussion of ‘data’, ‘risk’ and ‘factors’, and non-scientists seem to be regarded as receptacles for this data. As such they are subject to the opinion, that once they read the statistics, they will accept or reject the data logically. The problem with this, as we all know, is that most people factor in other things beyond percentages and technical data when making a decision, and most of the scientists in the meeting today know that – they just seem to forget it when planning a big, technically complicated venture like this. The discussions today frequently descended into debates over small technical questions, with no consideration as to whether these levels of detail would even matter to the people who will read the call for volunteers or submit their area as a possible location to store radwaste. It wasn’t until someone actually asked the question “but how much of this is actually relevant to this stage of the process?” that most people sat back and went, ‘well, it’s not’. How much technical data is necessary at this point in the process? 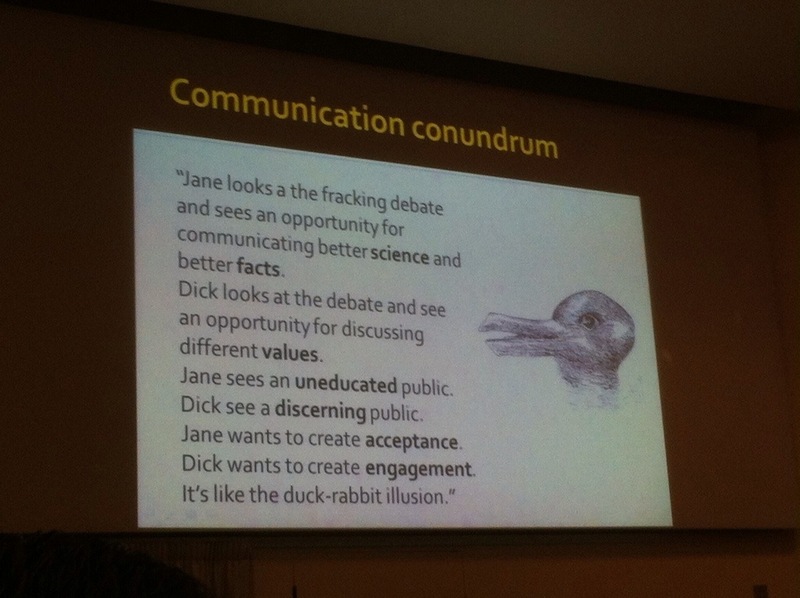 To me this reflects one of the biggest problems with communicating any science, but geoscience in particular. It is all too easy as a technical expert, to get swept up in the intricacies and interest of the data and the challenges it provides and you loose sight of the perspective of anyone who isn’t an expert. More and more often in technical conferences now, geoscientists are told ‘you need to have a communications person embedded in any endeavour from the start to aid in effective communication’, but I think this person also needs to provide another purpose. They need to be a fuse for the experts in the room and halt the discussions any time they get too carried away. Planning in geology is essential and considering the next step is vital for successful projects, but not if it comes at the expense of the first stage, where gaining the engagement of your resident population is at stake. This is ESPECIALLY important in an area where the topic at hand is controversial or perceived to be threatening. In cases like this ensuring the public enter the discussion with you at all depends on a delicate balance of trust and transparency, and by thinking five steps ahead and providing irrelevant (at the time) data, you can undermine yourself in terms of how a non-expert feels about your project. 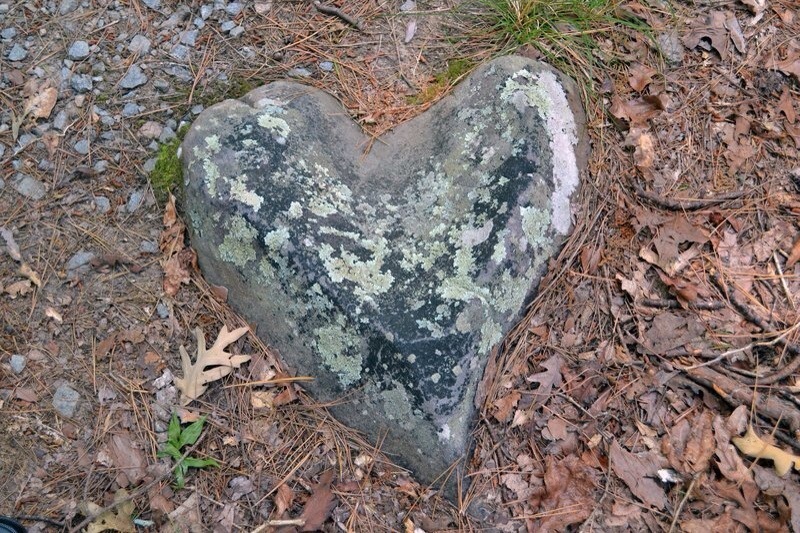 Anyone who has ever been buried by a mountain of information related to a decision that they are not an expert in can tell that this can make you feel uncertain and unconfident in your decision, and lead you to either seek an opinion from another (who may not be any more technically knowledgeable than you) or just adopt the more familiar choice. In that case heuristics wins over data, even if that isn’t actually the best thing. So in respect to the plan to request potential participants to submit their area for further examinations as to whether they are even suitable for radioactive dispoasal, I’ll be watching carefully to see just how complex the communications get, and how relevant they stay. For two weeks at the beginning of July I got the opportunity to meet a whole bunch of interesting people at the British Geological Survey and speak with them about what they do, why they enjoy it and why it’s interesting. It’s been a great opportunity for me to geek out at all the amazing things the BGS is doing and the brilliant people who work there. Dr Caroline Graham is described at the BGS as the ‘rock star physicist’, only better than the other one because she has actual rocks! She spends her time studying geomechanics – which is how rocks behave under pressure and how they break apart – she has even listened to the sounds that rocks make as they fracture and discovered that some rocks make a specific sound just before they break!! Now she spends her time examining critical rock resources like those we may use to dispose of radioactive waste or store carbon. You can read the post here. 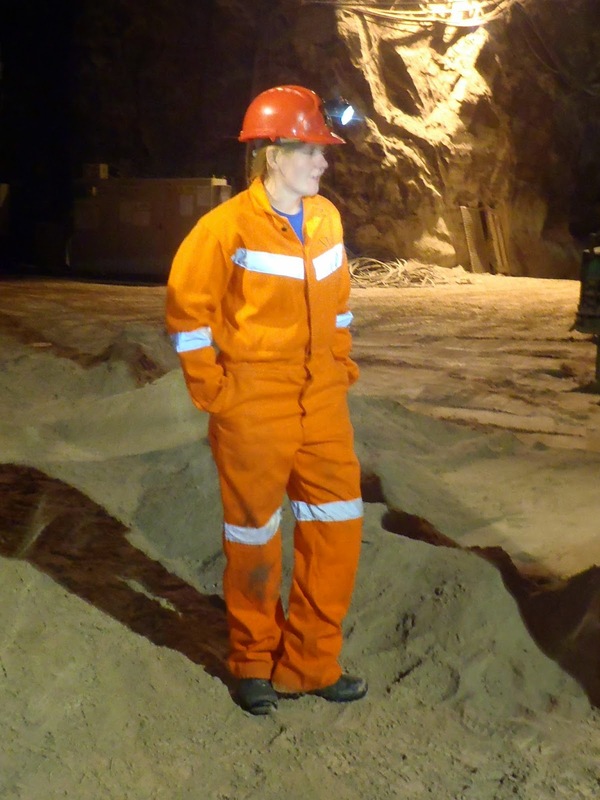 Dr Caroline Graham working in a salt mine. 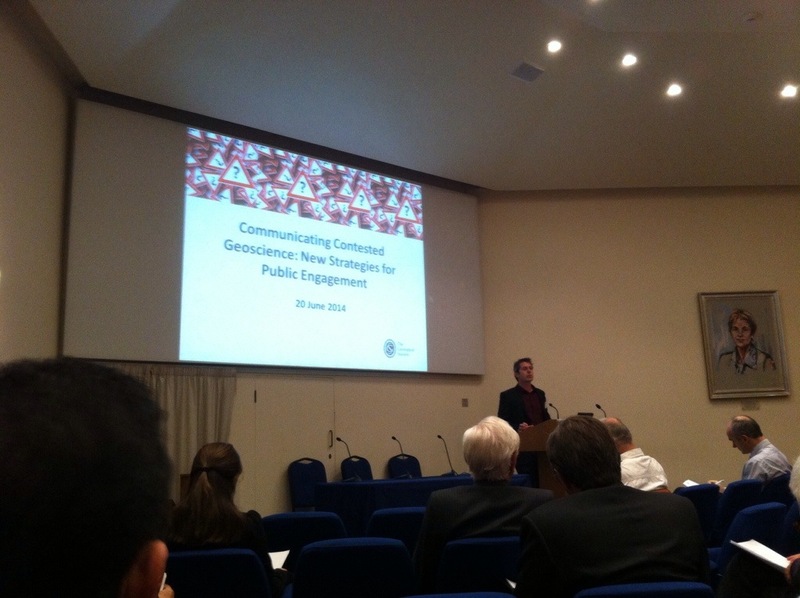 On Friday 20th June I attended the Communicating Contested Geoscience conference at the Geological Society’s Burlington House. 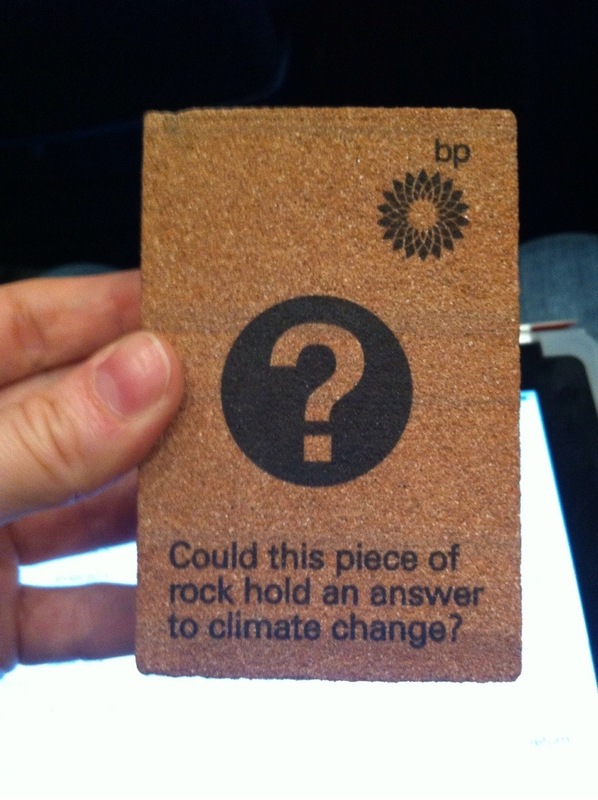 The title for this conference was ‘new strategies for public engagement‘ and it was focused on three of the more controversial geological subjects in development at the moment; carbon capture and storage, radioactive waste disposal and fracking for shale gas. The day featured speakers from across a wide range of public bodies and private companies, academia and industry and provided a brilliant synopsis of many of the biggest issues with communicating these subjects that geologists see today. The day was started off with Prof Iain Stewart talking about our responsibility to communicate what we do to the public and that reliance on the old style deficit model is no longer an option. The idea that ‘if we can get the science and then just tell that to the public then they will understand’ is no longer the case; as trust, relationships and fear all play a part in how the public respond to our attempts at communication. David Manning, the new president of the Geological Society gave the first talk of the day, reflecting on the role of geoscientists in society and the responsibilities of large organisations like the Geological Society to provide facts that allow people to make their own decisions. He mentioned that it would be next to impossible to fully represent their members’ opinions as with 12,000 members it wasn’t unreasonable that they would have to represent 12,000 opinions! He also introduced what was to become a central concept of the day, the role of the three pillars of sustainability – environmental, social and economic and the role of these in communication. At the end of this session spirits were running high and a number of good discussions on how to build and maintain trust and effective ways to engage with the community were explored and whether more or less data was better for transparent communication and understanding. One interesting point raised by a member of the audience was on the nature of risk – that it’s often easy to dismiss risk for the public because we know the statistics, but for the average person that risk is not approached in the same way. The second session of the day was about CCS (or Carbon Capture and Storage). The panel was chaired by Clair Bond from the University of Aberdeen and consisted of Andy Chadwick from the BGS, Jon Gluyas from Durham University, Kirsty Anderson from Global CCS and Clair Gough from the Tyndall Centre and the University of Manchester. 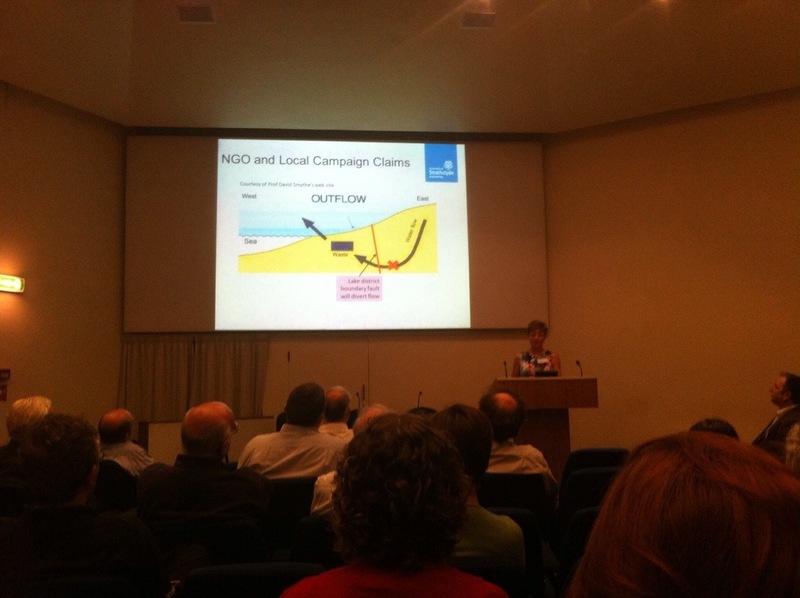 Although this session focussed on a range of ideas from the difficulty of communicating scales – even accurate ones – to understanding the societal context and peripheral issues of CCS, one of the best talks in my opinion came from Kirsty Anderson of Global CCS, the only non geologist on the panel. Kirsty talked about the value of having an embedded communication strategy at all levels of the project team and also stressed the importance using target communications early – which does not mean going to a paper early, but engaging with stakeholders and other key influential people. 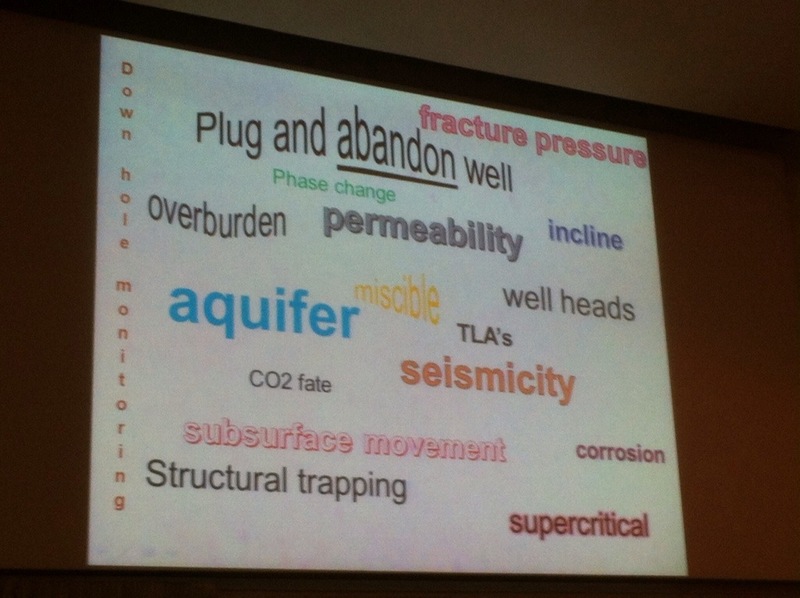 She also highlighted how words that we see as innocuous actually can leave a lasting impression – such as to ‘plug and abandon the well’ may leave thoughts of poor little abandoned orphan wells all over the country! We came out of that session mulling over the idea that controversial does not necessarily mean conflict, but that it is actually a critical element of the debate, which should not be ignored, suppressed or managed away. The third session of the day focused on Radioactive Waste Disposal. The session was chaired by Nick Smith from the University of Manchester and featured Rebecca Lunn from the University of Strathclyde and the Committee on Radioactive Waste Management (CoRWM). The panel was also made up of the two Bruces; Bruce Yardley from the Nuclear Decommissioning Agency and Bruce Cairns from DECC, and Phil Richardson from Galson Sciences. This session was interesting as it looked at the pressing issues of radioactive waste disposal – how much waste we have already and the need for long term solutions – and how they make this a particularly challenging issue. In addition the obvious notions about what makes secure storage are not necessarily true – in some locations a fractured geological storage can be used as the geology itself is not necessarily the barrier to flow, but what keeps the engineered barriers in place. Once again there was lots of discussion about when to communicate and how to get in touch with communities, but was interesting was how the discussion had started to shift back towards the deficit model of communications. The discussion became less about dialogue and more about information transfer – what to tell people, not how to engage them. The final session focussed on the central issue to all the topics of the day – public engagement. The session was chaired by Iain Stewart, the keynote was presented by Nick Pidgeon from Cardiff University and the panel consisted of Ruth Allington from GWP Partners and David Reiner from the University of Cambridge. This was almost a summing up session, exploring the social context of risk and how we apply local issues to the national question, but also about the importance of images and of a balanced mediation in dealing with the public and industry. However, after these issues were raised in the presentations, focus of the questions seemed to slide back to information transfer. It almost seems like we need to get this discussion fully out of our collective scientific system before we can move on to new methods and approaches. ‘the things we do for love’. For more info and links check out the Storify.